A CLASSIC DRESSING: The perfect way to use your homemade mayonnaise is by making – The Green Goddess Dressing. This year (2015), we celebrate the newly renovated Palace Hotel, where an inspiring chef developed his famous ‘Green Goddess’ dressing. This classic dressing was invented in the 20s by Chef Philip Roemer at the Palace Hotel in San Francisco, to commemorate the popular play “The Green Goddess”. The play was a hit, so was the dressing! 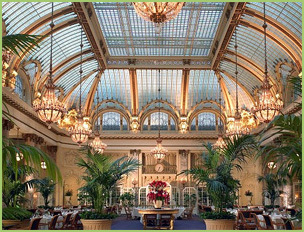 The Palace Hotel has preserved the original architecture while adding modern accents. Today, we pay homage to the dressing’s inventor and add our modern accent to the Green Goddess Salad Dressing! Mix all ingredients together. Refrigerate dressing up to 7 days. VARIATION: Add chopped spinach and/or minced garlic. FOOD TIP: Use this versatile dressing as a dip. Instead of tartar sauce try the Green Goddess dressing on your fish. Let the mayo sit for half an hour to blend the flavours. Taste and see if it needs salt. *To make tarragon vinegar, place sprigs of tarragon in your white vinegar – for best results age your vinegar for 2-3 weeks. 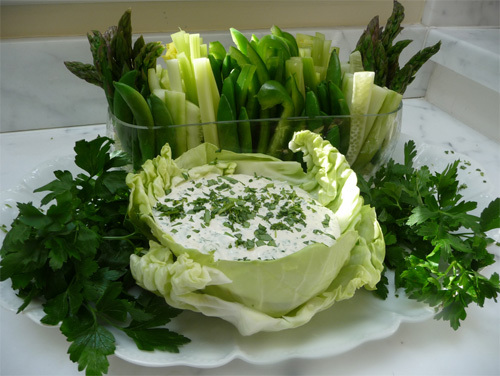 Green goddess dressing and tarragon vinegar’s popularity resurfaced in the 80’s. If you don’t have tarragon for this dressing, you have enough greens to create the green “goddess” colour. 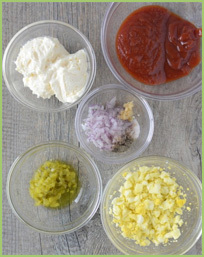 Russian dressing: consists of the mixture of mayonnaise, pimientos, chives, ketchup, and spices. History: The name comes from the earliest versions that included a distinctly Russian ingredient, caviar. Oh my. Must try !!!!! You have such beautiful presentation!